I checked a bee yard on Sat evening. I haven't been there since I checked for queen acceptance. I started with 3 lb - Hygienic Italians on the first load, I put them in on April 26th. They are all on drawn comb and there was no honey in the frames when I installed them. I fed all of them a gallon of Pro-Sweet syrup when I put them in. Being I have been swamped with the second load of bees, selling queens and my day job working long hours, also the weather has been bad when I wanted to check them. I thought they may have starved on me. Lucky for me they all looked great. The Pro-Sweet syrup is more concentrated than regular 1:1 sugar syrup and I know that saved my bacon. The dandelion and fruit bloom covered me until yesterday. I added a second box to all of them and they needed it. I also checked for swarm cells and found none. I added a pail of Pro-Sweet syrup, hopefully this will cover me for 10 days. I will check their food supplies then. They may need one more pail to get me to the main nectar flow. The queens in this yard are Hygienic Italians. I know all of the queens work well and anyone can lead to success, but I usually prefer Carniolans for their gentle behavior. I know the Hygienic Italians will put away the most amount of honey, but I do find Carniolans for the most part are the gentlest breed out there. The cool spring has really set back our traditional season. This season as of now seems about two weeks behind. My dandelions were two weeks behind. I still have some blooming even now. The apple orchard down the road from me is in full bloom. Normally the fruit bloom is around May 15th in our area and here it is almost June. Many hives have been a little slow to build up early because the cool weather prevented the bees from expanding the brood cluster. The bees had to hold tight to cover 4 frames for example instead of doing 6 frames. This held back the numbers of bees in a colony that only now, for many beekeepers, have finally turned the corner and are really only now getting a good population. Divides have been postponed due to low numbers of bees. Now what will happen? The nectar flow more than likely will be delayed. Maybe two weeks. That will start the major nectar flow starting more towards July 1st. The hive populations will be ready early, possibly before the flow starts. Now the fruit bloom is on the wane there will be a dearth of available nectar until hay starts blooming. After the hay crop is in there will be nothing until clover starts the flow. I think this may be a big swarming season. Beekeepers will have to be vigilant on checking for swarming behavior in their colonies and applying proper management to get to the nectar flow with all of our bees. Having this large population when the flow hits should give all beekeepers a great crop of honey this season. We are open Sat 9 - 3 this weekend. Closed Sun and Mon. All of my colonies I installed from the April 23rd delivery are ready for their second box. The ones I have started on foundation and have been feeding syrup to draw foundation, have 80 % of the comb drawn out. I take one of the outside frames that the bees are working on and move it up to the second box. This bait frame will make the bees move up into the second box that has just foundation in, faster. I will now run 9 frames, evenly spaced out, in the bottom box and 10 frames in the second box. I also change the entrance reducer to the larger opening. 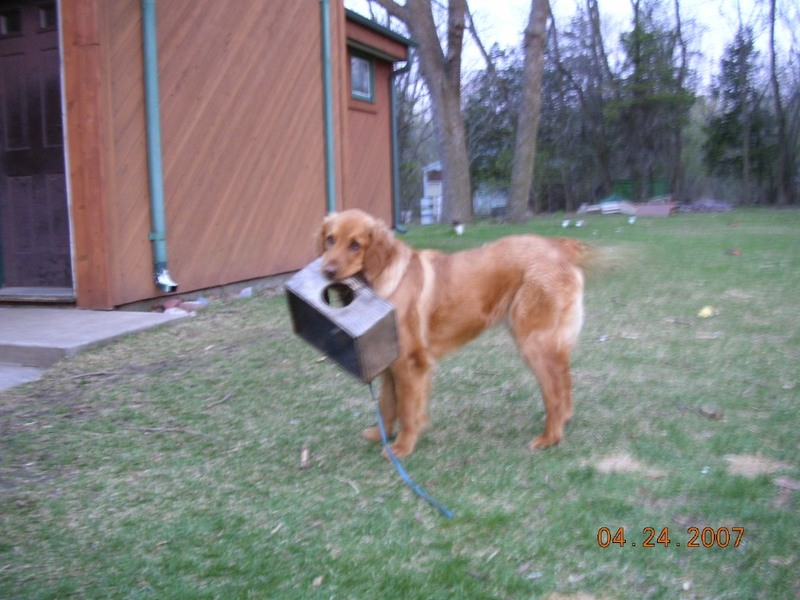 The feeder pail is moved up on top of the second box. I continue to feed syrup to keep the bees in a nectar flow until all the frames are drawn out. I know if I stop feeding, the bees will not draw out the foundation. 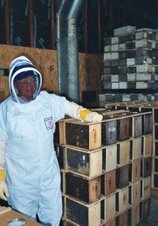 This beekeeper purchased two queens from me to do divides on his overwintered colonies. 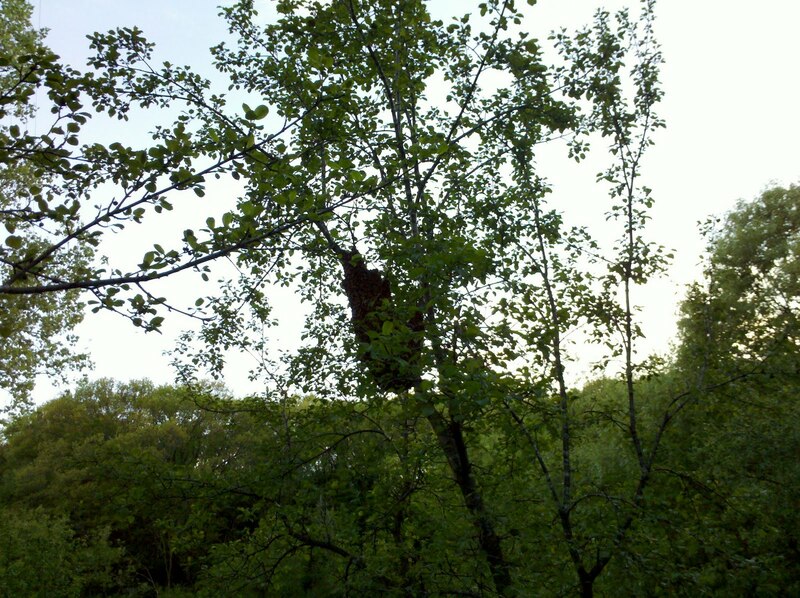 When he got to his bee yard he saw this swarm in a buckthorn tree. It is a beauty, about 5 lbs of bees. Luckily he was able to get it off the tree and into a deep. Notice the quilt on the ground. When a swarm is shook into a box. Having a sheet or something similar underneath the box, makes it easy for any spill over bees an easy access into the hive. The bees march right in. The first time I did this I was amazed how easy it was. Photos by Scott Holisky. Thanks for the photos Scott. He was able to do his divides and his hives are doing great. This is a pic of the new bridge over the gateway trail just south of me. 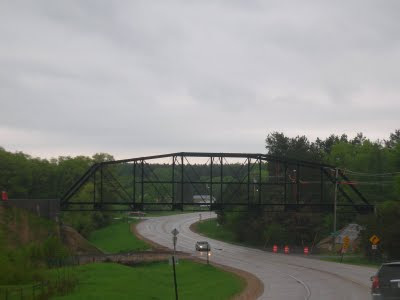 The bridge came from Koochiching county. This is why I divide my strong over wintered hives. I did get a call from a beekeeper that wanted a queen. The later e-mail came with a picture of a swarm and a cancel the queen request. Over crowding or an old queen are big factors in swarming behaviors. 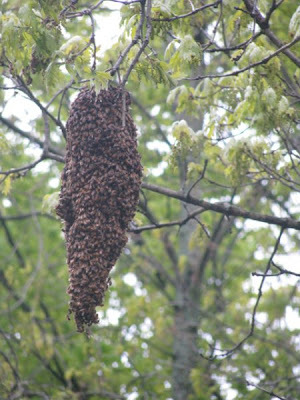 A hive that swarms is unlikely to produce excess honey for the beekeeper to extract. The bee front is getting back to normal. The change is deliveries has made me not blog very much so everyone was up to speed on the delivery date change. The bees are all seem to be doing great and I have been hearing very high rates of acceptance. All of the beekeepers on this last load it is important to check for eggs now to make sure the queen has been accepted. Closed on Fri and Sat. We will be closed on Fri, May 13th and Sat, May 14th. We will be open Sunday May 15th, 9 am - 3 pm. 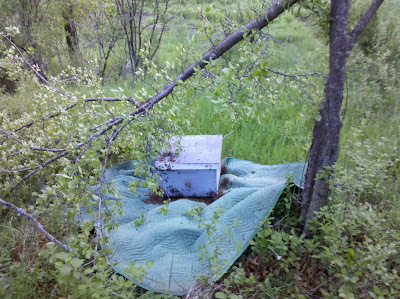 This beekeeper damaged her cage and will not be getting her cage deposit back. Returning cages: They have to be my style of cage, no others will be accepted. Remove and discard all feeder cans and queen cages. Make sure cages are clean with no debris inside. Any torn screens or broken boxes will not be accepted. On bee day. Due to the number of people picking up bees. We will only be selling pollen patties $3.50 each, syrup $32.00 5 gallon pail, feeder pails $4.50 each and fumigillan .5 gm $19.00. Prices include applicable tax. Most of the transaction happening will be outside, so I will not be taking credit cards.